Kolkata, Oct 23 (IANS) Though they lack big-game experience, Indian referees can officiate in top level FIFA events, feels head of refereeing Massimo Busacca. “Referees from India were here one week when we did the preparations. So it was my decision to invite a group of elite referees and instructors. To see how we are working. To how top professional referees wake up in the morning and be ready for a game,” Busacca told reporters on Monday. “My feeling was that they really appreciate and really understood what they have to do. Now it’s in their hands. So in the future, they know what they have to do and a top referee has to prepare for a match. I saw a group of referees motivated. “Still they lack experience of top game but we saw in this country football is increasing and in my opinion in few years also top referees from India will be at top level FIFA competition. I am really sure,” he added. 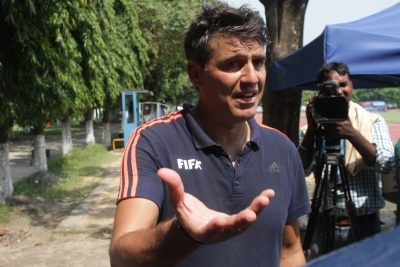 Asked why Indian referees were not included in the panel for the ongoing FIFA U-17 World Cup which is being hosted by the country for the first time, Busacca said: “This group of referees and assistant (referees) is part of a project, Candidates for World Cup Russia 2018. “Normally in some seminars we invite some referees who have the potential to officiate in the future. But in FIFA competition we prepare referees for the next World Cup. We also take into ranking of confederation. If I take Asia we see there is no candidate. Busacca also lauded India’s enthusiasm for this tournament, saying he has never seen such turnouts for an U-17 World Cup before. “How many spectators we had during the game? This is amazing! I have never seen so many spectators for an U-17 World Cup. Never. “So that means football in India is in the blood. It’s not only cricket or other sports but we saw you also have football. Even the national team was playing well probably not big experience but we saw very good individual skills. You are ready to organise a World Cup. You are also enjoying football,” Busacca said. The Vivekananda Yuba Bharati Krirangan saw a record 66,613 spectators turn up for Brazil-Germany quarter-final on Sunday. A full house is expected for the final as well on October 28 with tickets being sold out well in advance.